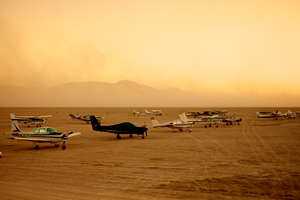 The Black Rock City Municipal Airport, FAA identifier 88NV, serves both general aviation and charter flights all the way out to the playa. Yes, you can fly to Burning Man, as long as you have a ticket. Don’t expect cushy service, though. There are no vending machines, ticket counters, wastebaskets, or taxi cabs here. The same principles of Radical Self-reliance, Decommodification, and Leaving No Trace apply here as they do everywhere else in Black Rock City. Never been before? Be sure to peruse the First-Timer’s Guide thoroughly before you land. Once on the ground, the crusty and professional crew of 88NV will take care of you. The Black Rock City Municipal Airport website will tell you everything you need to know about flying in and out of BRC, sky diving, RC/drone aircraft, and how to get involved.